Perennial herb from a short, stout, erect stem-base and taproot with secondary fibrous roots, the stem-base somewhat brown woolly-hairy; stems erect, few, simple, finely grooved, short stiff-hairy, 15-45 (60) cm tall. Basal leaves lanceolate to oblanceolate or narrowly elliptic, smooth to long-hairy, 3- to several-veined, 10-35 cm long, 1-4 cm wide, stalked, entire; stem leaves lacking. Inflorescence of dense bracteate spikes, the spikes more or less egg-shaped, becoming cylindric, 1.5-8 cm long, almost 1 cm thick; corollas greenish, 4-lobed, the lobes 2-2.5 mm long, spreading or reflexed; bracts widely egg-shaped, more or less equal to the sepals, thin, pointed; sepals next to the bract united; stamens conspicuous, yellow. Capsules, narrowly egg-shaped, 3-4 mm long; seeds 2, rarely 1, ellipsoid, shining, blackish, minutely roughened, 2-3 mm long, deeply concave. Mesic to dry lawns, fields and waste places in the lowland, steppe and montane zones; common in SW BC, infrequent N along the coast and E in BC; introduced from Eurasia. "The family Plantaginaceae includes three genera and an estimated 250-275 species from diverse habitats throughout the world (Pilger 1937). In Canada, the family is represented by two genera containing seven introduced species and ten native species" (Bassett 1973). Bassett, I. John. 1973. The Plantains of Canada. Monograph No. 7. Canada Department of Agriculture. 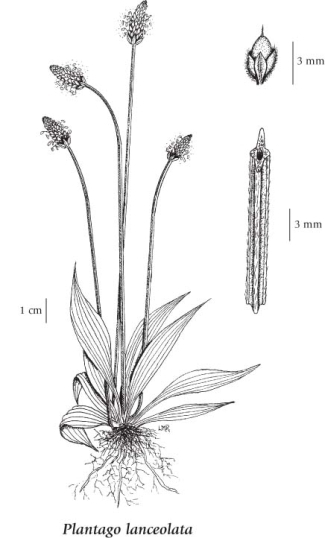 Plantago altissima auct. non L.